No one wants to get stuck at home all the time, but what are today’s increasingly mobile families to do about transporting baby? Even if a parent simply needs to work in the kitchen or the home office, baby might have to rest alone in her room. Slings and carriers are great, but sometimes, it’s nice to just have a sturdy place for baby to rest… but still be able to be on the move (in style, of course!). Dorte Grau has an innovative solution to the mobility issue that grows with the blossoming child. “The Kidskoje is a revolutionary, patented, new, and innovative sleep, transportation, and game concept,” explains Grau, the mother of two. When Grau says innovative, she means it: while the Kidskoje mobile cradle has its roots in American Indian and Scandinavian design, it goes beyond a simple place where baby can rest. Grau considered several important aspects of product design and function when she created the baby carrier: the comfort of baby, the mobility of families, and the future of both families and the environment. The Kidskoje baby carrier is at the nexus of art, sustainability, and utility. The Kidskoje looks a lot like a stabilized, compact, hollowed-out tree log, making it the perfect shape for babies up to six months old. It has been developed from sustainable materials, and is manufactured in Germany, which is well known for creating long-lasting, precision products. Padded shoulder straps attached to the cradle allow for easy carrying and movement. Families will adore the way the Kidskoje mobile cradle can be used to bring baby just about anywhere in style and comfort — from a day at the park to resting while mom works at her desk. Its lightweight, modern design allows for easy access to the baby and quick storage. 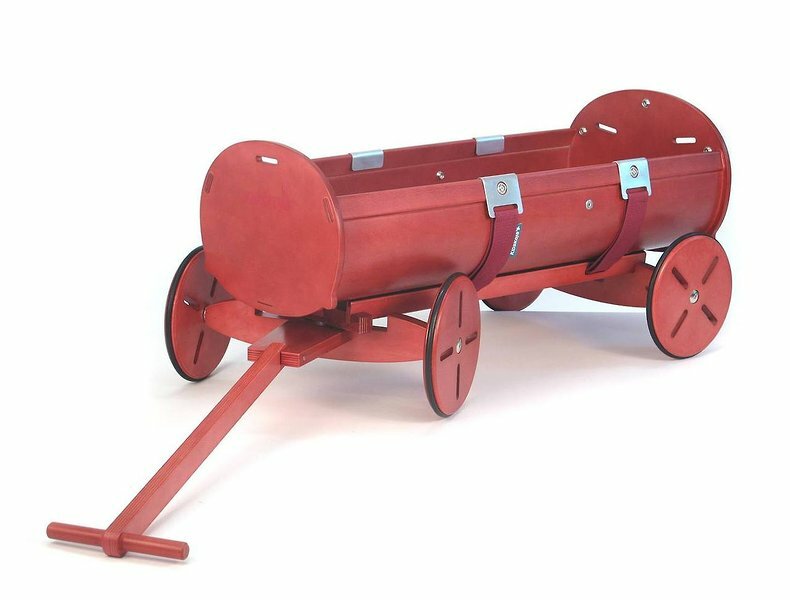 When baby has outgrown the cradle, it easily transforms into a portable toy carrier or wagon (with the addition of wheels; the company currently offers sets in a natural wood color). Since it is built to last, the cradle can be passed down from child to child, or to the next generation as a family heirloom. 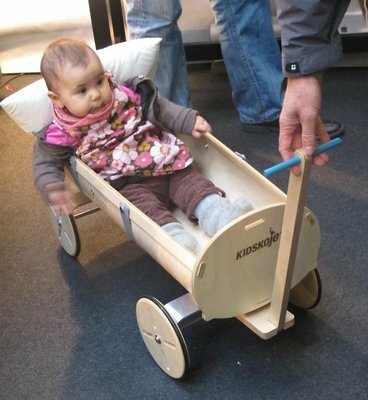 The Kidskoje mobile cradle is available in natural birch, as well as blue or red. A variety of comfortable, eco-friendly accessories are available, like foam and organic wool mattresses, along with cotton covers in a range of earth-friendly colors, including red, light gray, or turquoise.